The first church at Tilehurst is thought to have been built in 1189 for the monks of Reading Abbey who served the place until the Dissolution of the Monasteries. The oldest part of the present building is the South Aisle or Lady Chapel, dating from the the late 13th century. 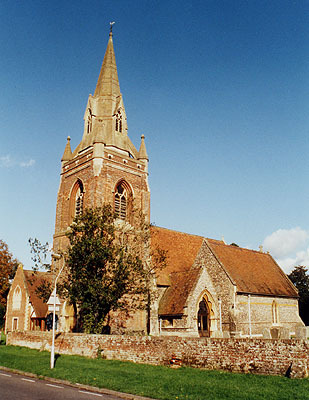 The church has a fine Georgian brick tower (1730), though this is less obvious since its remodelling and the addition of the spire in 1855. The interior was almost entirely reworked at this date and the North Aisle was added too. The building's chief treasures are in the South Aisle. Most obvious is the dramatic renaissance-style monument to Sir Peter Vanlore, the best of its period in the county. He was a Dutch merchant who financed lucrative trips to the West Indies. Hence the black boy on his crest. When he subsequently turned to banking and money-lending, he made enough money to purchase the Manor of Tilehurst (in 1604). He lived in the manor-house he built on the site of the present Calcot Park. Sir Peter and his wife, Jacoba, lie together surrounded by the symbols of death and diminutive figures of their nine children, only two of whom survived their parents. They are the two not holding skulls. Alongside is an old brass to a certain Gawain More, a marshal at the court of King Henry VII. Perhaps his parents were fans of King Arthur's Round Table. Between the two is a beautiful stained-glass window by William Morris, depicting the Virgin and child surrounded by angels playing medieval musical instruments. The baby Jesus is shown as a toddler of one year old since it commemorates Mrs. Mary Bradney who died (1867) in child birth after only one year of marriage. The main east window in the chancel is also very fine. It depicts St. Michael and St. George, surrounded by scenes from the life of Jesus, the twelve apostles and twelve old testament prophets. The extension to the north of the church was completely paid for through local donations and fund-raising. It was completed in 1993 and consists of meeting rooms, an office and kitchen, sympathetically linked to the church by a cloister and garden.